The Kwid's dashboard follows a simplistic design theme. The cabin gets an all-grey layout with piano black elements and chrome inserts thrown around for added detailing. A single front airbag (driver side) is offered on the top-spec RXT(O) variant, while anti lock braking system (ABS) and electronic brake force distribution (EBD) are absent from every variant. Renault Kwid roof gets sharp contour lines. Arching roof rails are limited to the range-topping Climber variant. The most apparent change on the new model is the fresh design of the front grille. It now comes with two horizontal slats, which have chrome detailing on the RXT trim. The Renault bow-tie logo continues to be placed in the middle. The circular fog lamps are located in a larger black plastic housing with a protruding horizontal insert in the middle. This design element makes the Kwid look more butch. These fog lamps are available only on the RXT(O) and Climber variants. Also visible here is the exposed front tow hook that gives the car a rugged look. The headlamp assemblies are blacked out and thus give a stealth look to the car's face. The main halogen unit is housed in a circular reflector while the turn indicator bulb is located near the grille. A C-shaped chrome insert is located near the outside edge of both headlight assemblies. The instrument cluster is an all-digital unit. It gets orange-coloured fonts and symbols. The top-end RXT variant gets a comprehensively detailed MID, which reads out instantaneous and average fuel economy, distance travelled, average speed, distance-to-empty, and fuel consumed. The warning lights are placed on the right side of the console, while the left side houses the digital fuel meter. The updated Renault Kwid gets a rearview camera on the top end RXT(O) variant. The video output is streamed on the 7.0-inch touchscreen infotainment unit placed on top of the centre console. A manual air conditioner is offered on all variants except the entry-level STD variant. None of the variants get the option of an automatic climate control. The highlight of the interiors is this 7-inch touchscreen infotainment system, which is available only with the RXT(O) trim. It accepts audio inputs from AUX, USB, FM and Bluetooth. There is no provision for using a CD or SD card. Meanwhile, the lower RXL variants come with a basic single-DIN music system with AUX, USB, FM, CD and Bluetooth support. 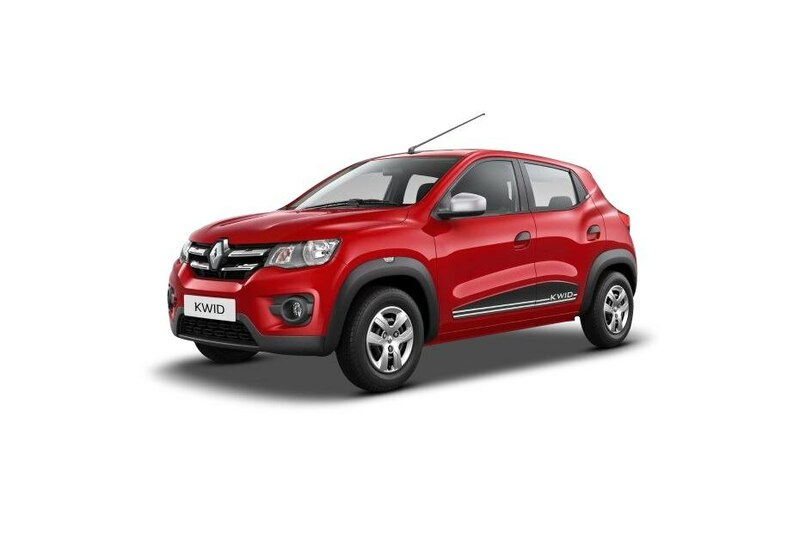 The Renault Kwid is offered with a 5-speed manual gearbox as standard. Additionally, a 5-speed AMT automatic unit is offered as an option with the 1.0-litre models. The side profile is characterised by the squared-off wheel arches with prominent plastic cladding. Wheel covers, which are available on the RXL and RXT(O) variants, get a black treatment. Also notice the new Kwid branding on the lower part of the doors. The Kwid doesn't get alloy wheels on any variant. The RXL and RXT variants get black full wheel covers, while the lower variants come with just a black hub cap. The front power window switches, hazard light switch and central locking button are located on the center console just below the AC controls. The empty round space on the right is occupied by the gear selector knob on the AMT versions. Front power windows are available from the RXL and above, while the rear occupants don’t get power windows on any variants. The Kwid is available with front and rear seatbelts, but none of them get height adjustment functionality. The Renault Kwid comes with a segment-leading boot space of 300 litres. It can be extended to 1,115 litres by folding the rear bench. The rear parcel tray visible here is only available in the top-end RXT(O) variant. The side turn indicator has been neatly integrated within the front wheel arch cladding. This is an unconventional placement as most modern cars get turn indicators either within the ORVM caps or on the front fenders. A basic key with lock and unlock buttons. Central locking is offered in the RXT(O) variant only. The Kwid is available in a total of five colours - Fiery Red (seen here), Ice Cool White, Moonlight Silver, Outback Bronze and Planet Grey. The special edition Renault Kwid Climber is now available with a centre armrest at the rear. However, the same is not available on any regular variant of the Kwid lineup. A new 12V power socket has been added for the rear seat occupants. However, it is only available on the RXT(O) variant. The three-spoke steering wheel gets a chrome Renault logo on the horn pad. Electric power steering is offered only in RXL and RXT variants, which also get a piano black insert on the lower spoke. The indicator and wiper stalks feel good to operate and appear to be built using decent quality plastic. The center console and AC vents get a chrome border around the edges. This adds a premium feel to the car's dashboard. However, the piano black area is tough to maintain as it attracts fingerprints and other stains quiet quickly.